We knew there were alligators in this massive park and thought that if we were lucky we might just catch a glimpse of one; if we were really lucky we might just get a picture. 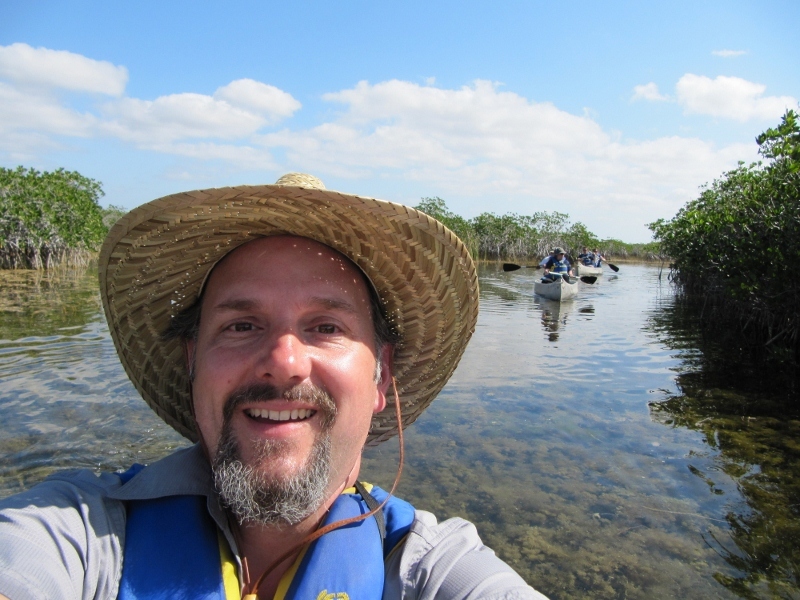 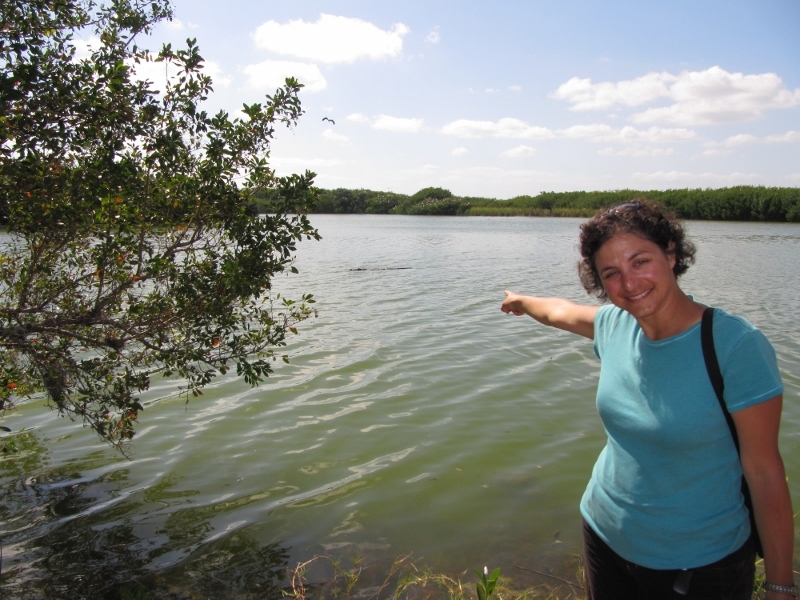 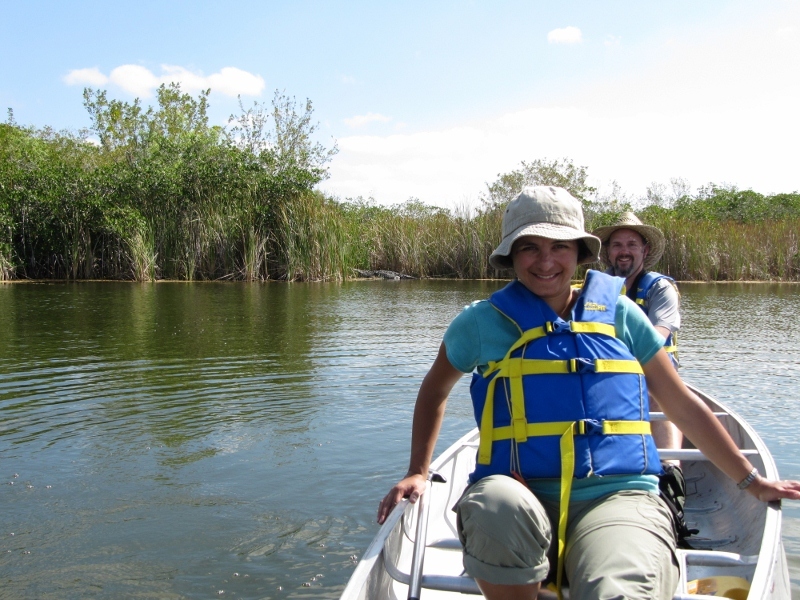 So you can imagine our excitement when we signed up for a free half-day canoe trek through the mangroves where alligators are known to congregate. 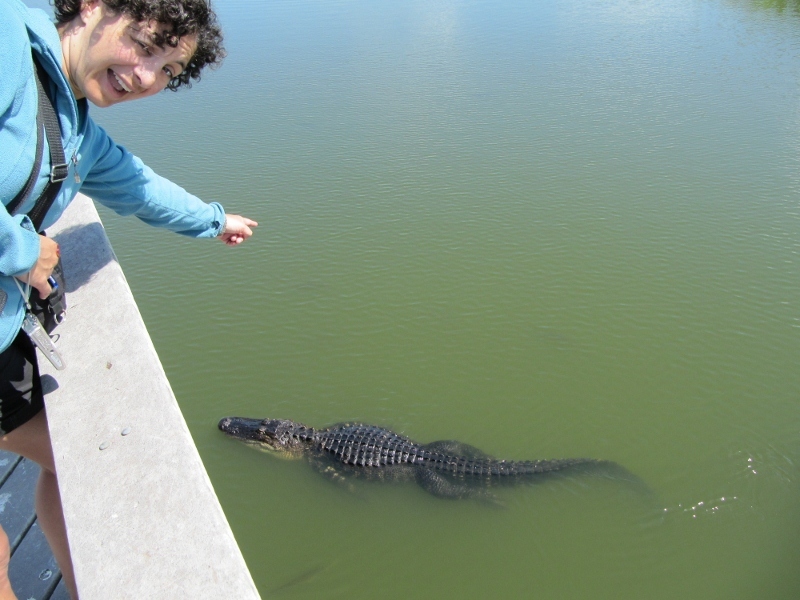 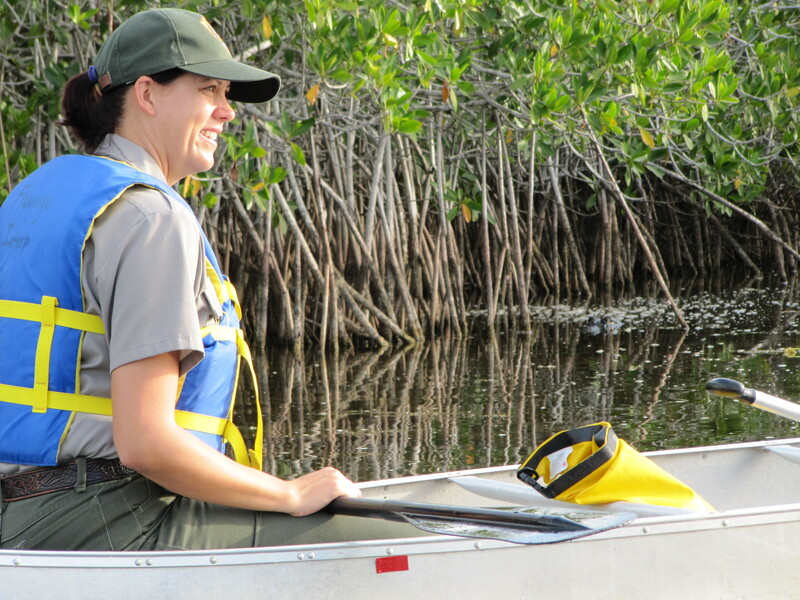 Shauna – the Park Ranger leading our trek – assured us that there have only been one or two KNOWN alligator attacks on humans. 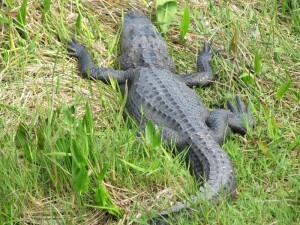 Which give us little comfort after seeing signs all over the park for a missing camper!!!! 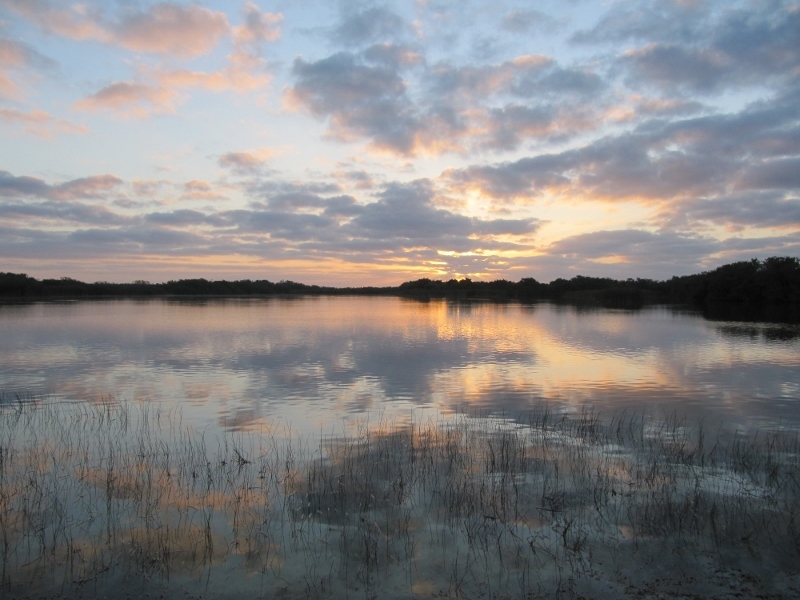 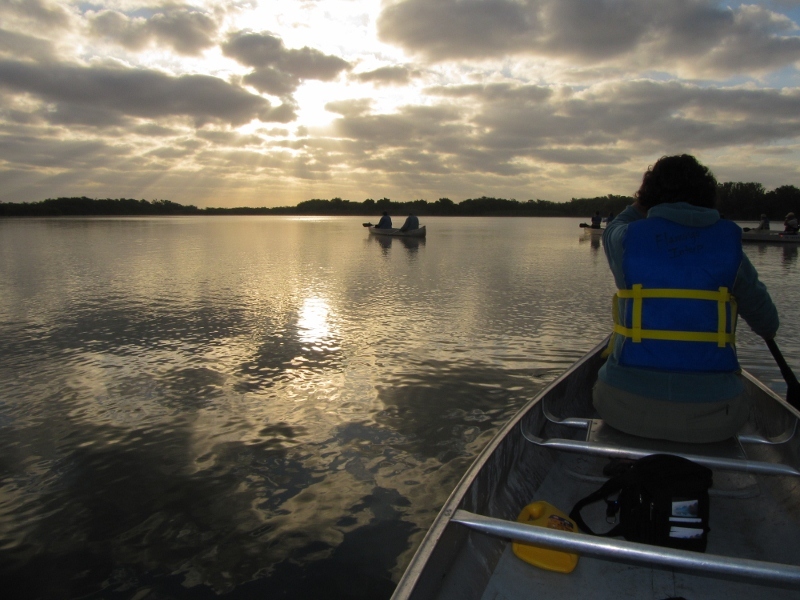 On the morning of March 23rd at 7am we launched our canoes into the still waters of the everglades and this is what we found…. Beautiful sunrise to the canoe trip into infested water. 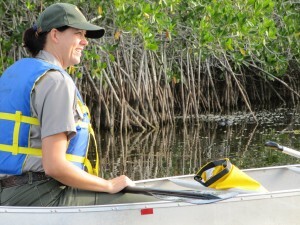 Marianna bravely paddles to keep up with the Ranger ahead. 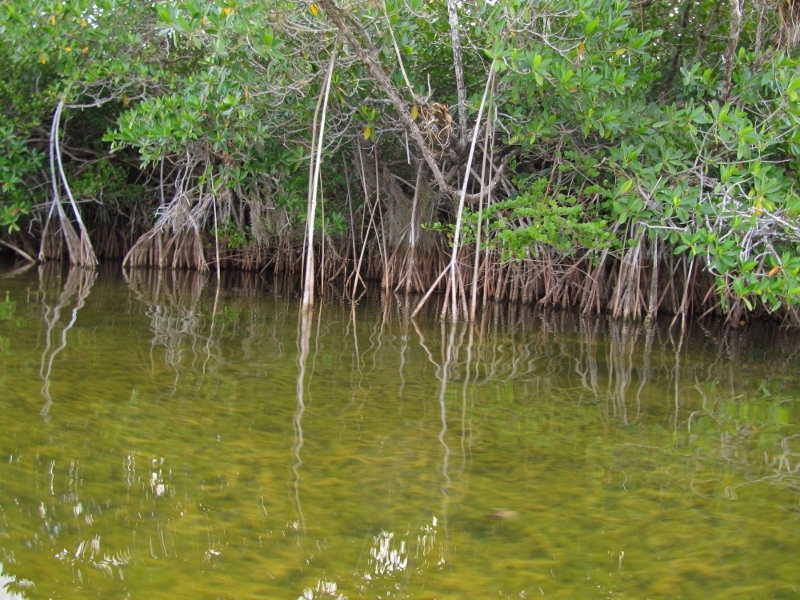 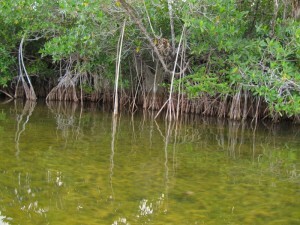 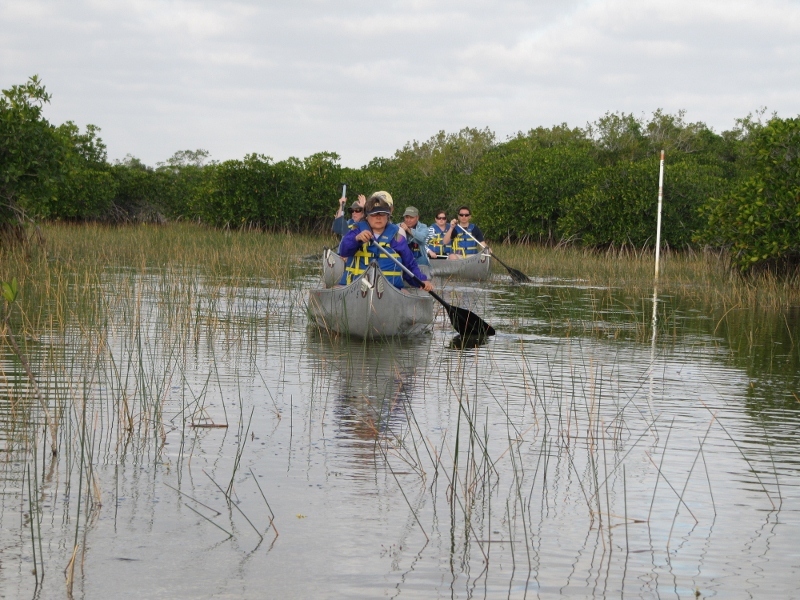 The group leaves the open water of the pond and enters the Mangroves. 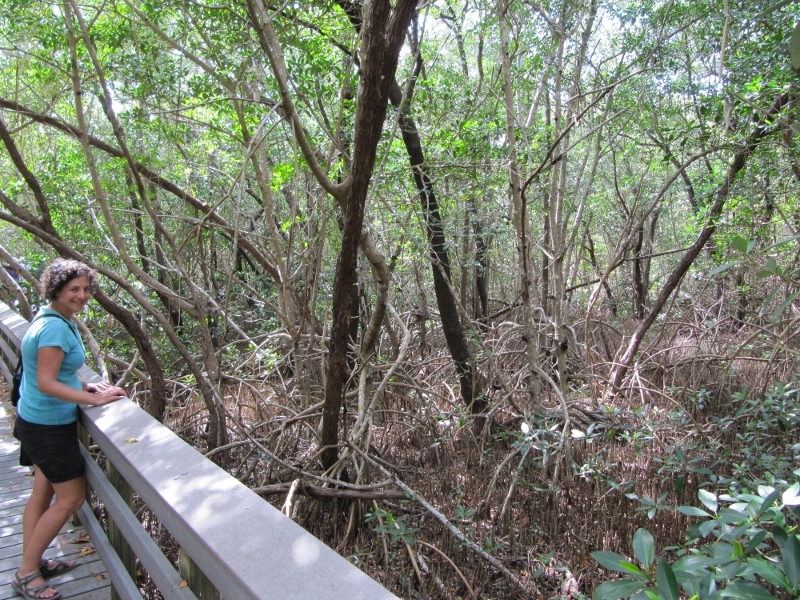 Mangroves like these enclose our path. 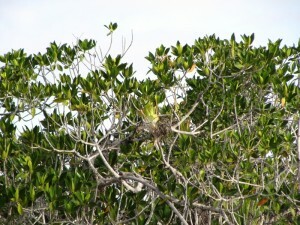 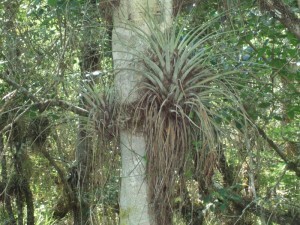 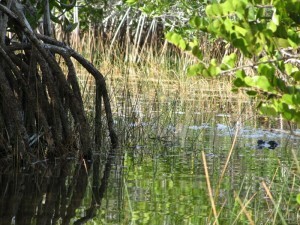 Jason takes a picture of two types of air plant in the mangrove branches while Marianna watches for Gators. 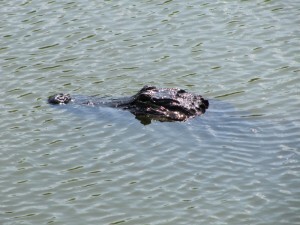 Just as we were wondering if we'd see any gator someone notices two strange bumps in the water....it's a gator!!! 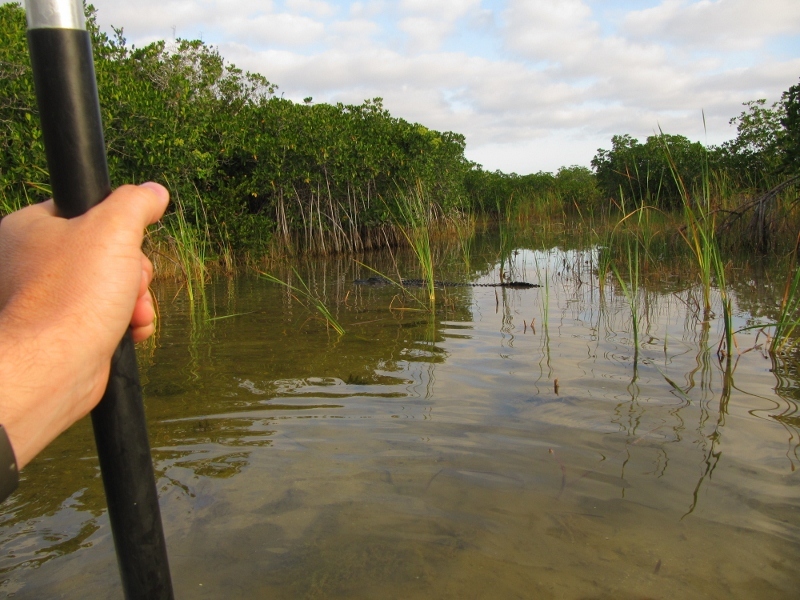 As we turn the corner in the tight mangrove we see another one blocking our path so we just paddle swiftly by. 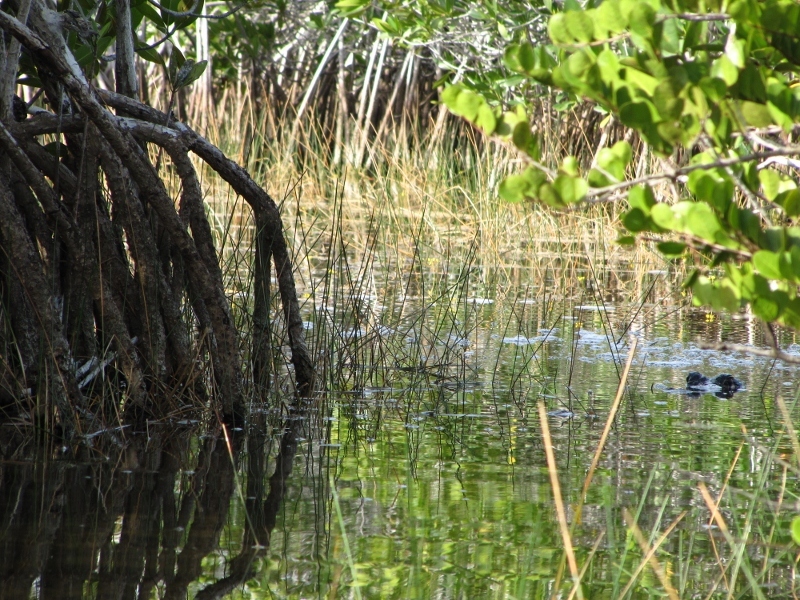 As the mangrove pathways get tighter and tighter another Gator comes down the pathway towards us, blocking our way forward...there is no room to turn around so we wait until he moves over to one side before the Ranger assures us it's safe to quickly paddle by...we pass within 10 feet of the gator...the lead Ranger (with a juicy tourist in the front seat of her canoe) passes by within five feet! We finally reach an open area in the mangroves where the group takes a rest. 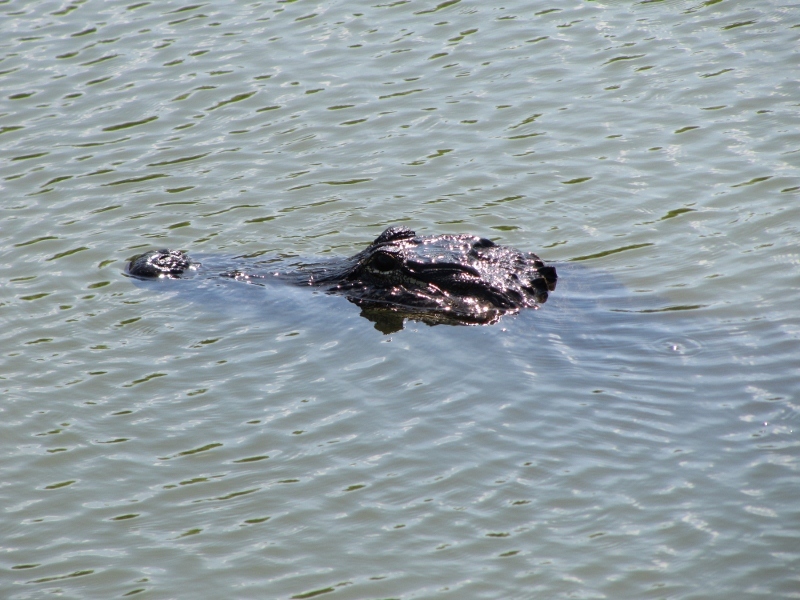 Little did we know there was a Gator skulking close by...zoom in to see if you can find the Gator in this picture. 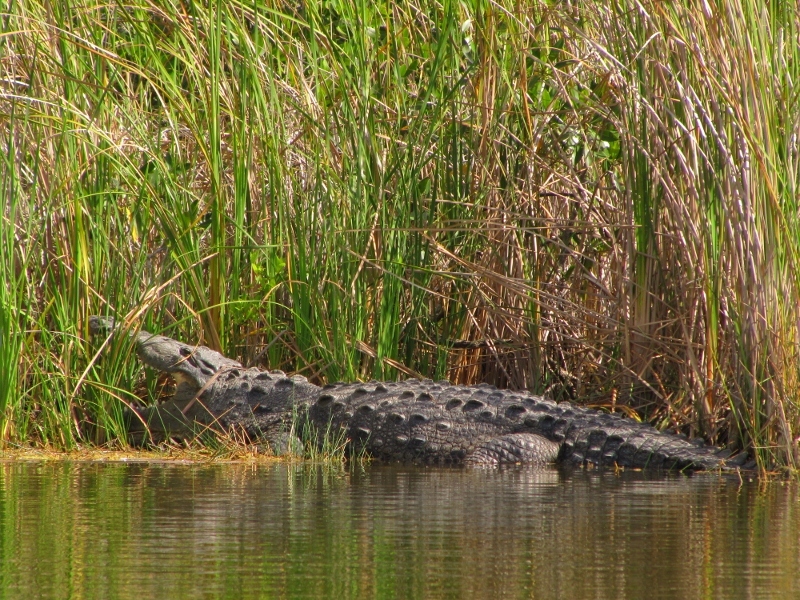 Getting more comfortable with the Gators as I pause to get a picture. 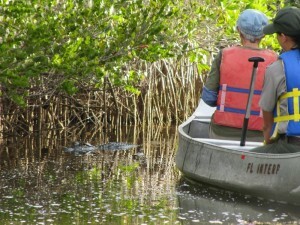 The trip runs into snag when the low water levels cause the canoes to hit bottom. 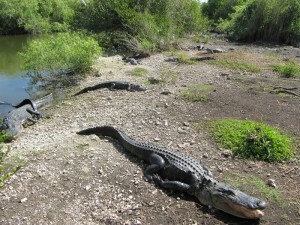 No worries - we muscled our way through. The canoe pathway opens up into a large pond and we get the shock of our lives - a 14 foot, 500 pound Crocodile with its mouth open! 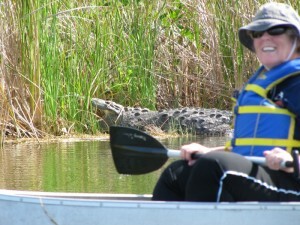 Is that a nervous smile? 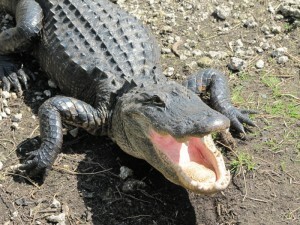 This is one of the few Crocodiles in the Everglades and the largest reptile we seen to date in all of the park. 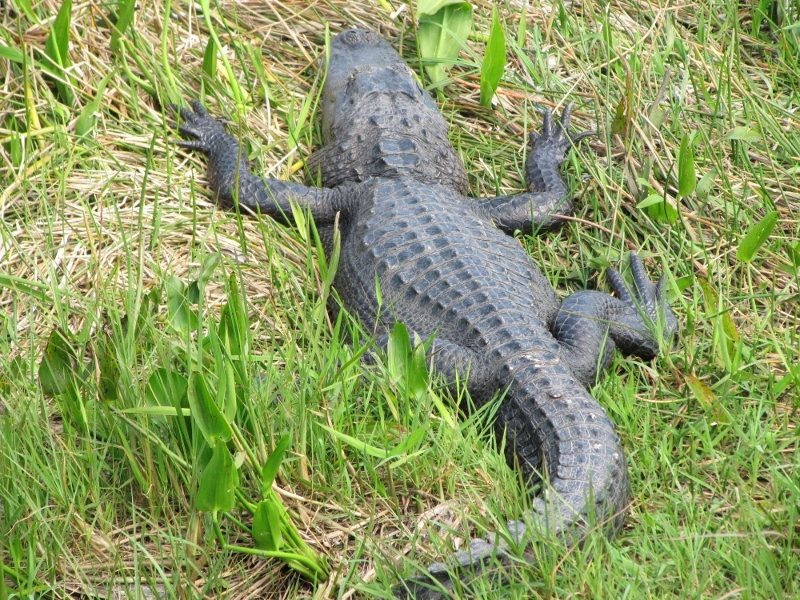 Strange when we are in the mountains we would run if we got this close to a Grizzly Bear but apparently Crocks and Gators will stay out of your way if you stay out of their's. 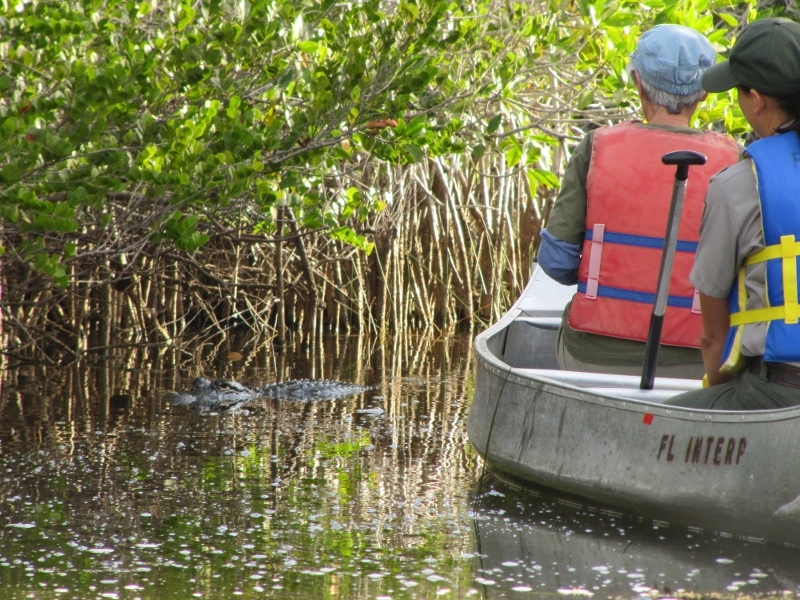 The canoe ride was the closest contact but we found way more sightings of Alligators from the raised platform hike at Royal Palms. 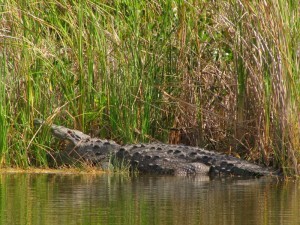 Here's a Gator just off the lake shore. 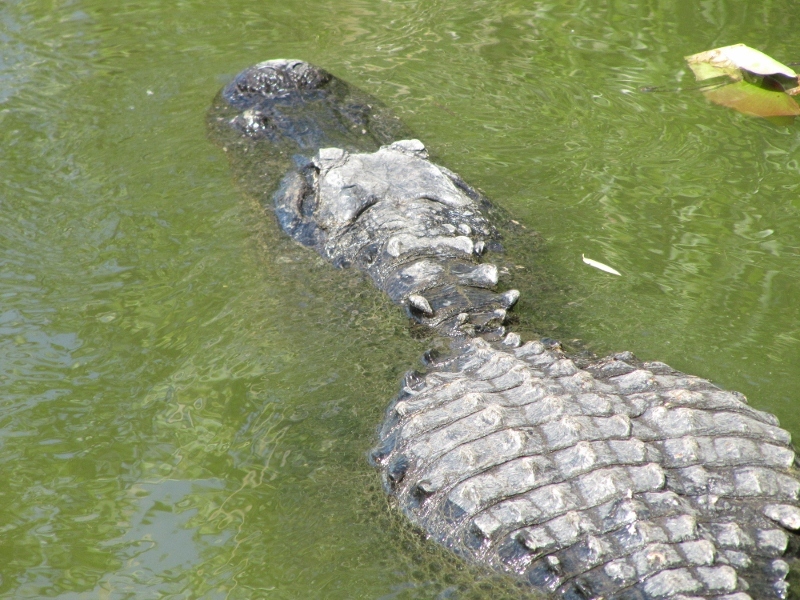 Gators swim just 5 feet below the walkway. 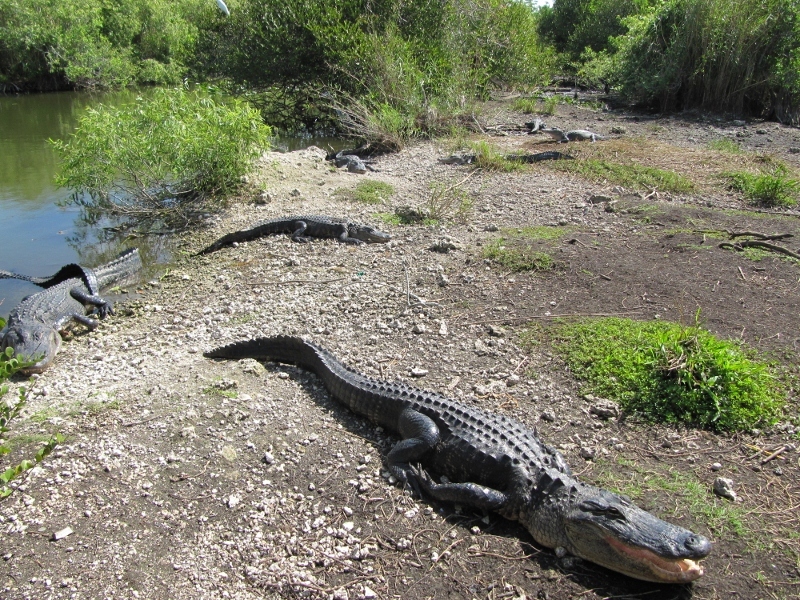 Aha, found their sun bathing spot! 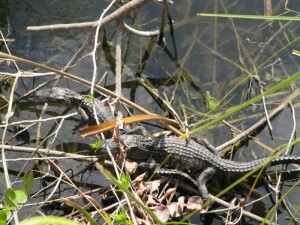 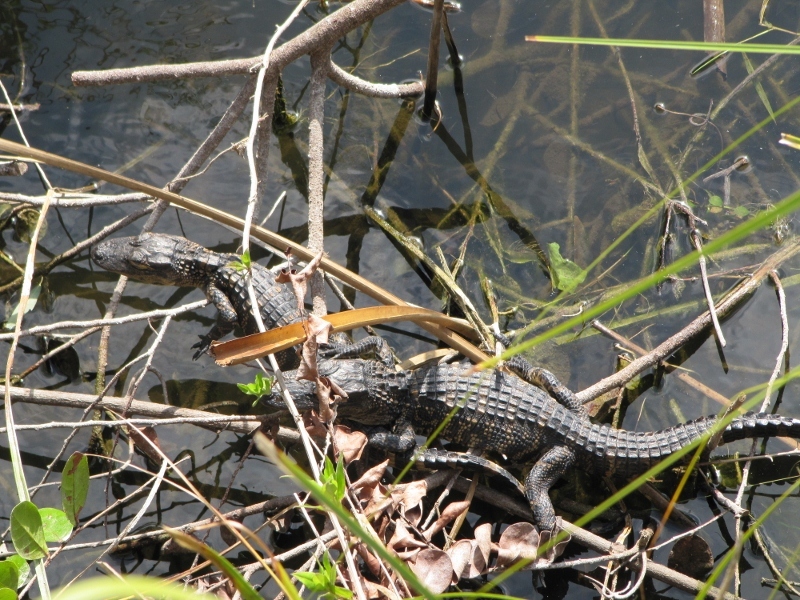 We even got some pics of baby Gators. Shauna let us know that alligators tend eat smaller creatures like fish, birds, the odd small dog etc. 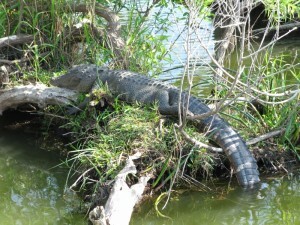 So, leave your pets at home and hang on to your kids! 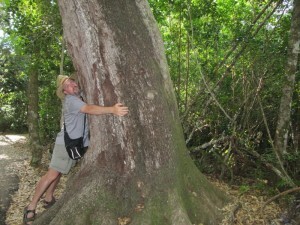 After all those alligators we took some time to do some tree hugging as well...this is one of the largest mohagany trees in the US. 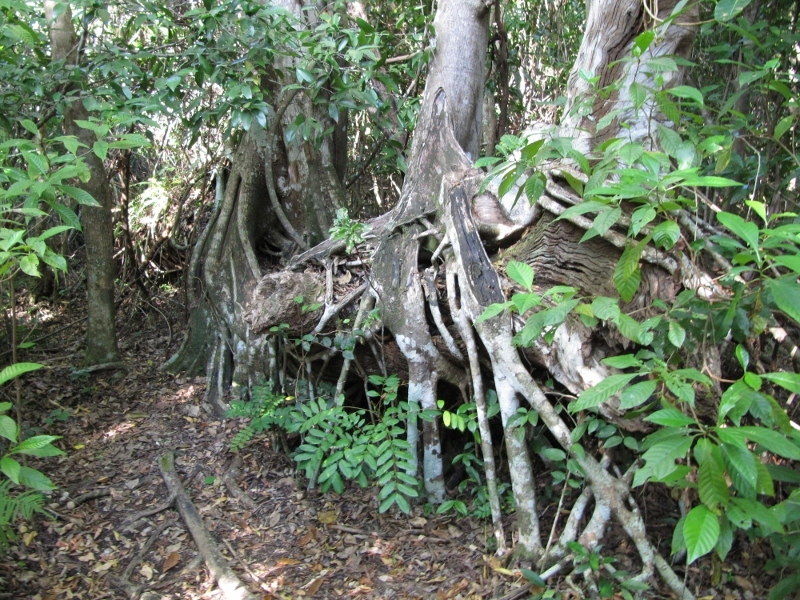 We took several free guided hikes of many different Hammocks (mangroves and slightly higher land areas which form small forests called hammocks). 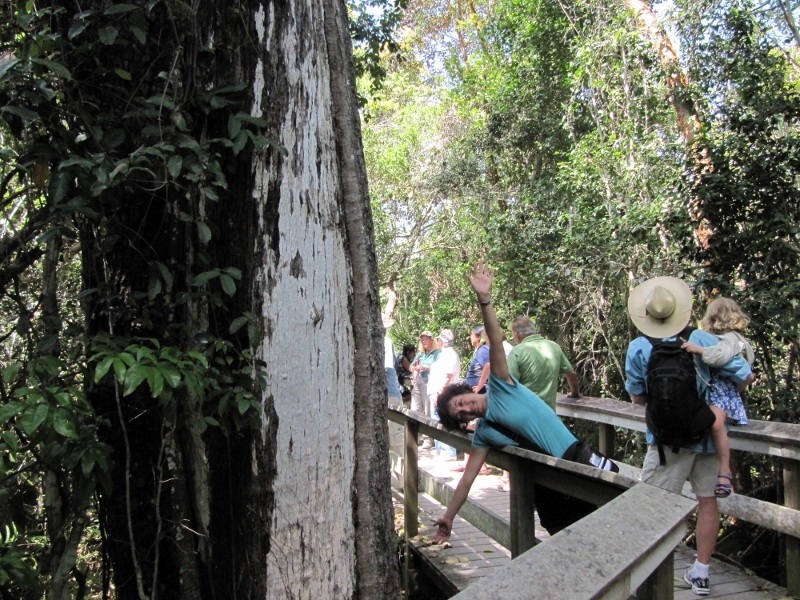 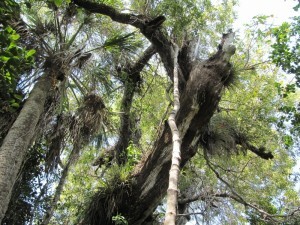 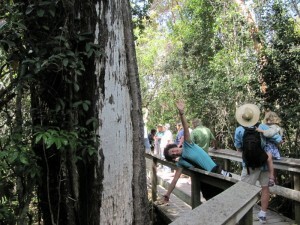 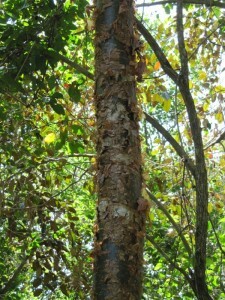 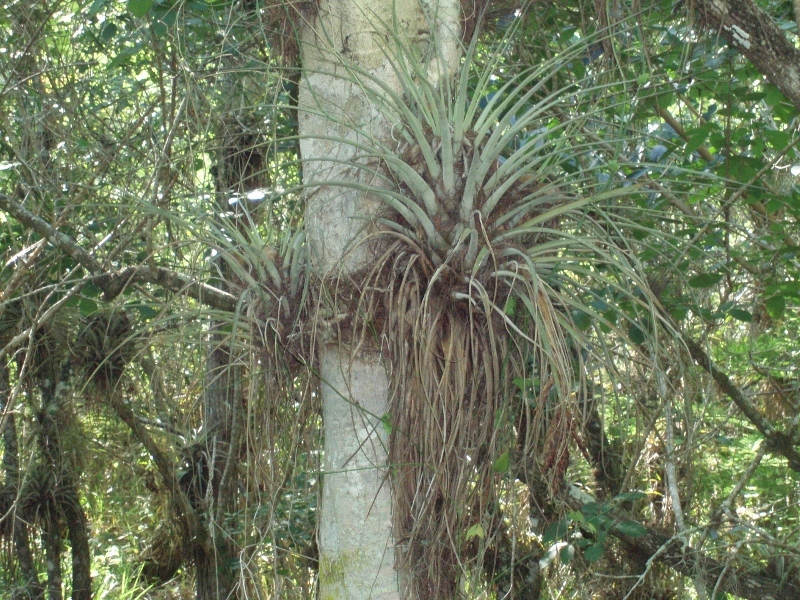 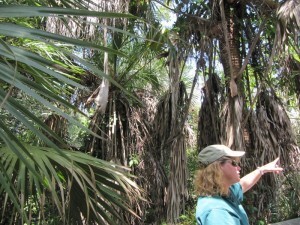 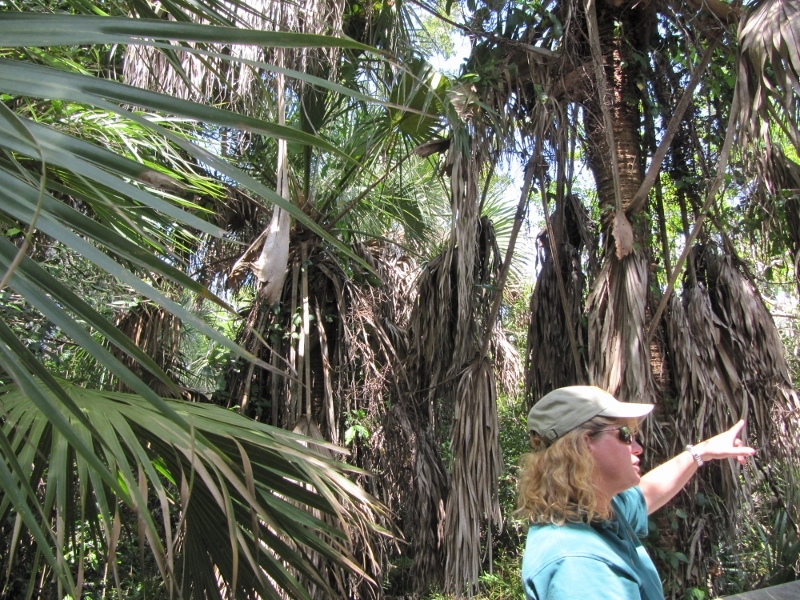 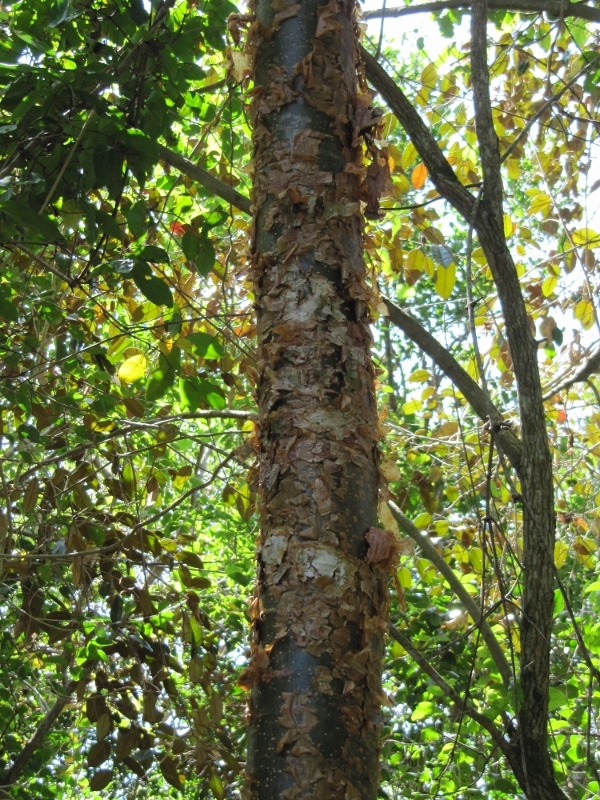 The gumbo-limbo tree is called the tourist tree because it peels just like tourists do. 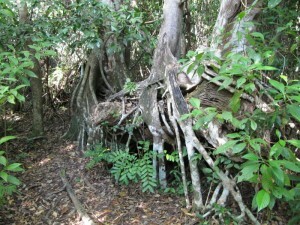 ...mangroves...There's even Spanish Moss in the hammocks. 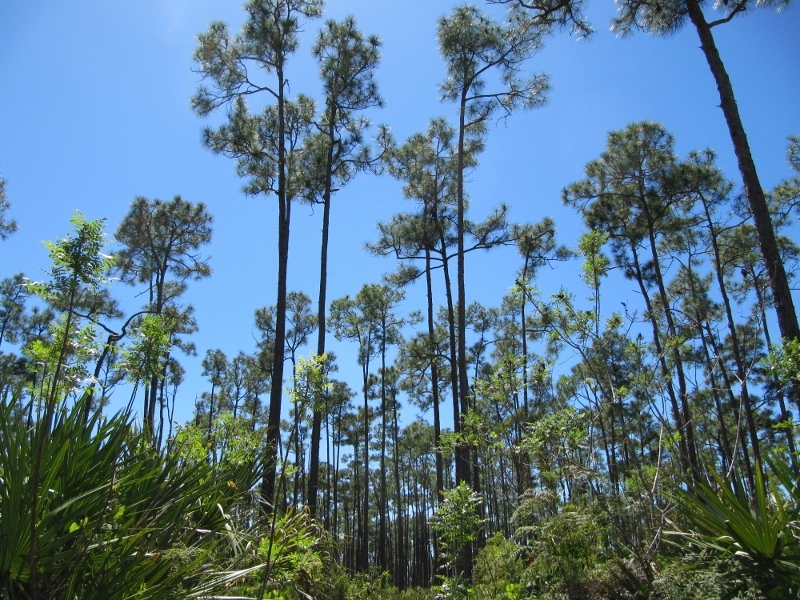 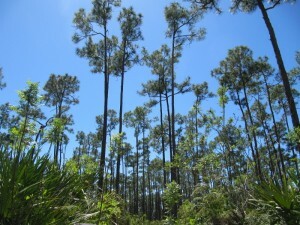 As we left through the northern part of the park we saw some sparse pine forest. 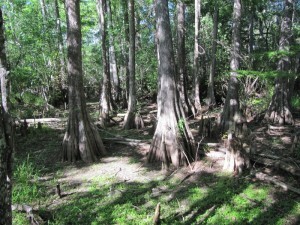 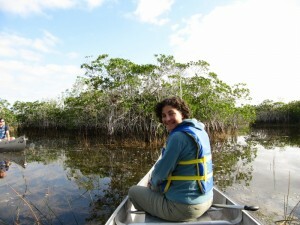 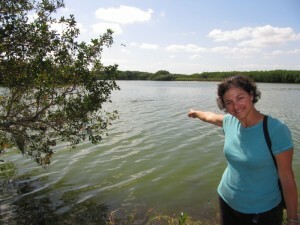 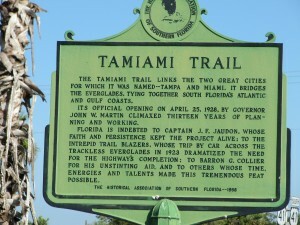 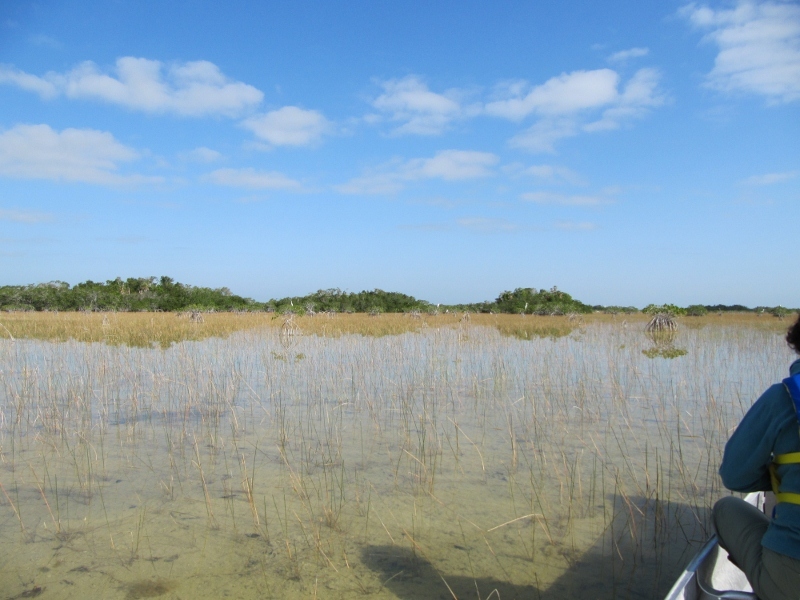 After a great time in Everglades, we headed up the Gulf Coast towards Fort Myers via the Tamiami Trail. 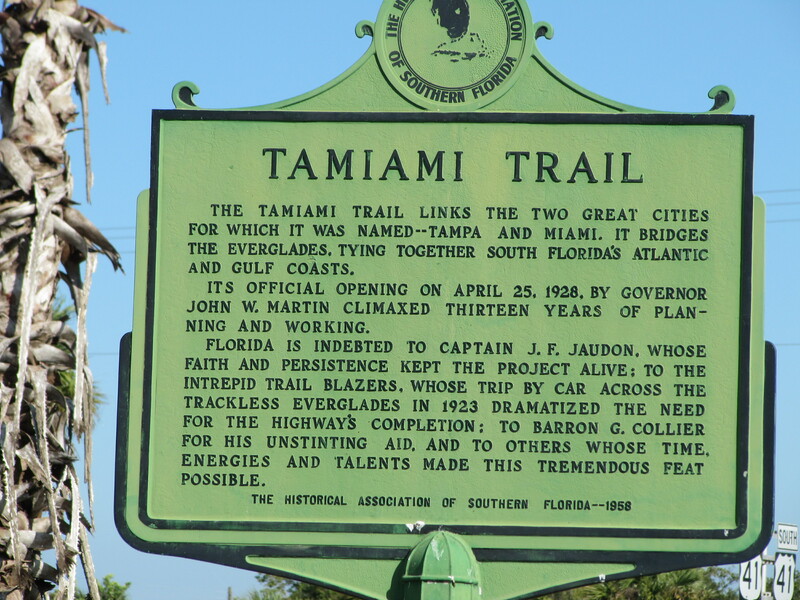 Next up - Fort Myers, FL!